The U.S. Air Force's top-secret autonomous space plane, the X-37B, is days away from breaking its own longevity record. The aircraft, which looks like a mini Space Shuttle, will on March 25 begin its record-setting 675th day in orbit, but we still don't know much about what it's doing up there. 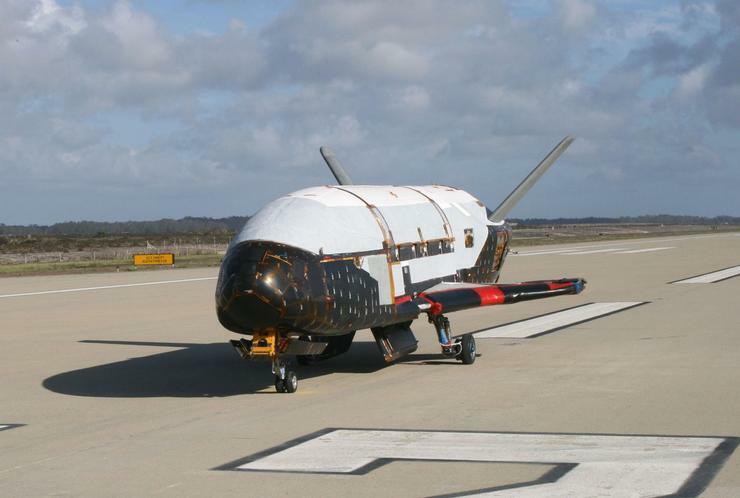 The X-37B looks a little like the Space Shuttle, but it's much smaller. It began life as a NASA project but was transferred to the Air Force in 2004 as part of the U.S. military's little-known space program. That's when it moved into the shadows. The program is owned by the U.S. Air Force's Rapid Capabilities Office, which is charged with expediting development and deployment of select Defense Dept. combat support and weapon systems. The office helps take strategic technology and accelerate its development, and the X-37B appears to be playing a part in that. The current flight, the fourth in the X-37B program and the second flight for this particular aircraft, began on May 20, 2015, when the plane was launched on an Atlas rocket from Cape Canaveral. 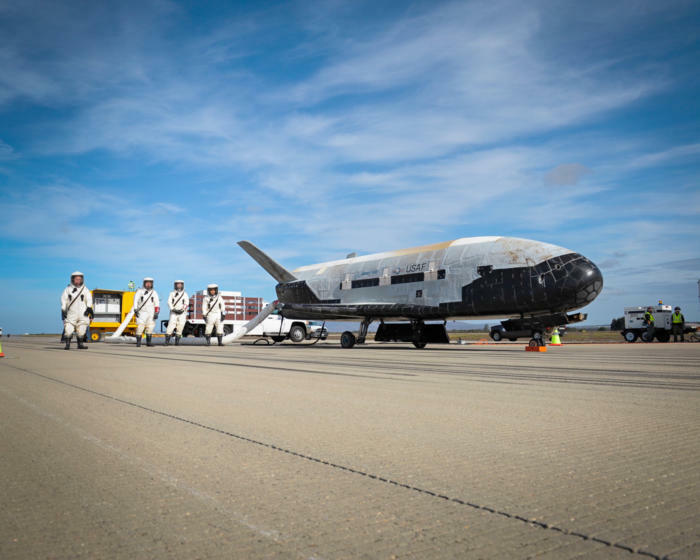 Recovery crew members process the X-37B Orbital Test Vehicle shortly after it landed at Vandenberg Air Force Base on October 17, 2014. The autonomous plane had just completed a mission totaling 674 days in space. At the time, the Air Force said the mission would help test new propulsion thrusters that it wants to use on communications satellites. NASA said it also had a experiment on the aircraft that would test various metals in the space environment. The craft's cargo bay, which is about the size of a pick-up truck bed, is probably crammed with other experiments too, but the Air Force isn't saying much about those. A clue about the mission can be gleaned form its orbit. While the U.S. government doesn't include the X-37B in its comprehensive list of satellite orbits, several amateurs have spotted it and published details of its path through the skies. That means it can be regularly observed and, with the right gear, even recorded. In this YouTube video from January 2017, the X-37B can be seen as a small spot traversing from the lower right to the mid left of the image. The orbit is similar to those of military surveillance satellites, leading some to believe it's acting as a testbed for new surveillance imaging technology. Using the X-37B would allow the military to test out technologies and perfect them before building entire satellites around them. It also means new technology can be sent into space quickly, potentially giving the Air Force new capabilities years before it would otherwise have them. In February, the X-37B made a slight change to its orbit, prompting speculation that it was maneuvering in preparation for a landing. That hasn't happened yet, but when it does, it could happen at Kennedy Space Center. The craft has landed at Vandenberg Air Force Base in California until now, but NASA has said future landings will happen in Florida.